You need a new garage door opener because the old one constantly malfunctions. You will be surprised to discover that there are hundreds of models available in the market. Brands are competing more vigorously than ever before, and this gives you both numerous options and the chance to pick a device which can pull off outstanding performance for a long time to come. Here is some practical advice to help you assess different models on how well they work. Remember to include all of these factors in the assessment of an opener. They are all very important for getting the best performance. Reliability - Can you expect smooth performance from the opener every time you use it? To answer this question, you should look at user reviews. You should also look for features which contribute to reliable performance. One of them is a technology which monitors the operation of the motor and stops it in case there is a problem with the door or opener hardware. This helps to prevent wearing and serious damage too. Speed -Check how fast the device can open the door. You wouldn’t want to wait long when you are in a hurry to go to work. Generally, screw drive openers tend to be the fastest, but it is always best to compare exact opening speeds. Remember that the closing speed is always the same for safety reasons. Energy efficiency - Generally, the DC motors tend to be more energy-efficient compared to their AC counterparts. You should also look for technologies which help to bring energy consumption down when the motor is in standby mode and when it is operating too. Noise level - This is a really important factor, especially if you have rooms above or next to the garage. The belt drive units make the least amount of noise followed by the screw drive ones. The chain drive electric operators are the noisiest. Other features can also bring down the noise level. The vibration-absorbing mounting brackets are a good example. All openers must comply with the UL 325 standard for safety. This means that they should come with safety sensors included in the package. These help to prevent accidents by signaling the motor to reverse the closing door when there is a person, animal or object underneath it. When it comes to security, the rolling code technology is a must. It changes the access code right after you use the remote control to open the door. 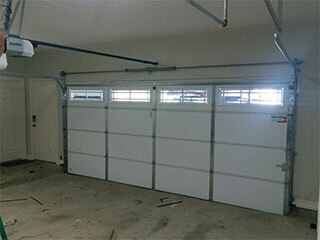 This eliminates the risk of someone learning the code and using it to get into your garage. To ensure that your door closes properly after you drive off with your car, you can opt for a remote that produces a signal that everything is fine. To ensure maximum security and convenience, you can take advantage of the latest technology for remote operation available with openers. The unit is connected to the internet so that you can monitor, close and open the door remotely. You simply need to have an app installed on your smartphone.